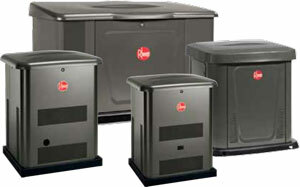 Rheem automatic standby generators provide permanent, backup protection from power outages for your home and family. Find the right generator for your home with flexible power solution options that allow you to select the level of backup power protection needed for your household. Covers your home’s basic circuits providing backup power to your lights, refrigerator, television, computers and other small appliances. Designed to fit any property, this small generator has flexible placement options, making backup power a reality for many homeowners. Fully Automatic – Advanced electronics will detect a utility power outage and automatically start the generator whether you are home or away. 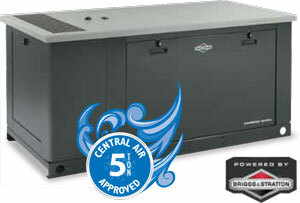 Flexible Placement* – Tested against the tough NFPA 37 standard, Rheem 8-10-12-16-20kW† standby generators can be placed as close as 18" from the home providing more placement options in your yard — perfect for tight lot lines. Reliable Engine Power – Powered by a premium Briggs & Stratton engine, our 8-12kW standby generators feature a newly designed engine for standby applications for improved reliability, performance and durability. Our 10-16-20kW standby generators are powered by commercial-grade Vanguard™ engines that are design-engineered to dependably take on the most demanding jobs. Durable Enclosure – Rust-resistant, Galvanneal steel enclosures are made from the same materials used in the automotive industry. 3 or 4-Year Limited Parts Warranty‡ – We stand behind our warranty and make it easy for our customers to work with us. Ideal for extra large-sized and luxury homes, our commercialgrade 35, 45, and 60kW units allow you to meet the power needs of all of life’s luxuries — little and big. Whole-House Comfort – Rheem 35-45-60kW† standby generators will supply enough power to manage up to two 5-ton air conditioners in addition to essential household power requirements. GM Vortec® Engine – Tested and approved on trucks and SUVs, world class 4 and 8 cylinder GM Vortec engines provide sophisticated yet extremely durable industrial grade power — perfect for the high power demands of most larger homes or small businesses. Continuous Fuel Supply – A permanent connection to natural gas or liquid propane delivers uninterrupted performance with no messy gasoline storage and refueling. 4-Year Limited Parts Warranty‡ – We stand behind our warranty and make it easy for our customers to work with us. * Installation must strictly comply will all applicable codes, industry standards, laws and regulations. Running engines give off carbon monoxide, an odorless, colorless, poison gas so it is important to keep exhaust gas away from any windows, doors, ventilation intakes or crawl spaces. Carbon monoxide detectors must be installed and maintained in your home. †† Fuel consumption rates are estimated based on normal operating conditions. Generator operation may be greatly affected by elevation and the cycling operation of multiple electrical appliances – fuel flow rates may vary depending on these factors.